Welcome to my monthly income report on the Coders’ Startup. Creating and growing an online business has been one of the hardest things I’ve ever done in my life. But along the way I have realized that there are things that I’ve done that contributed to a disproportionate amount of success. In other words, not all results are created equally. I could spend 3 hours posting links to articles on Facebook, or I could spend 3 hours setting goals and reflecting on past failures… At the end of those 3 hours, which of the two tasks do YOU think will make more of a difference in 3 months time? Hint: It’s NOT the Facebook posts! So I’m treating the time I spend on these income reports as a valuable insight into the current health of my business, as well as a spring board for planting the seeds of future growth. And hey, if I just happen to inspire the heck out of a few of you, then job well done right? 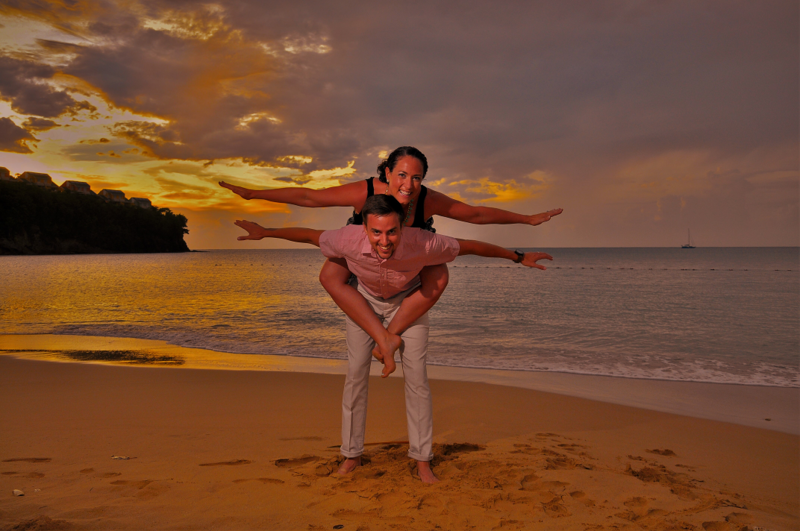 I was actually away for most of September, as I was on my honeymoon with my new wife! You’ll see a picture of us on one of the beaches on the right. Yes, we’re doing the eagle. And yes, we’re both so cute it hurts, I know, I know. It was an incredible vacation and we were both completely pampered and couldn’t have asked for a better time. 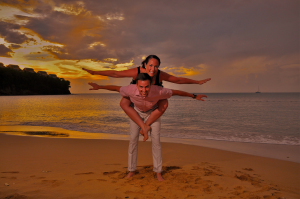 We went to Saint Lucia, which is one of the southern most islands in the Caribbean. If you want to see pictures of the resort, just click on this link (it will take you to a google image search). It was a magical time and we’re both sad that it’s already over so quickly. It’s back to the real world for the both of us now! Unfortunately, once I got home from the honeymoon, the realization sunk in that my business had a huge drop in sales. I’m talking, practically NO new sales whatsoever. After a HUGE amount of analysis, the only thing that I could think of was that the problem was in the new email sales funnel that my copywriter was designing. Specifically, the omission of any scarcity email sequences. To figure out how I came to this conclusion, I’ll walk you through my analysis. Since the vast majority of my sales comes from my Java course, and the only way I sell that course is via my email list, I knew where to start. What changed with my emails? Unfortunately… everything changed. That’s why I hired my copywriter in the first place. So to cement a lesson I had learned a few months ago, wherever possible, split test first. Don’t just completely change something that’s already working well. In any case, lessons learned aside, how did I decide it was the lack of a scarcity sequence that was to blame? I dove into the analytics of the new email sequence. There were still plenty of leads coming in every day, so that’s good. The number of people clicking on the links to view my sales page were actually UP compared to my old campaigns, so that’s great! But my new sales revenue had tanked. How in the world does this make sense? I’ve got MORE people interested in viewing my sales page, MORE people watching the sales video (almost 2x the normal amount), but the conversion rate for the people purchasing from the sales page has dropped significantly. I use SendOwl to help process payments for my products, and within the SendOwl product they keep track of the people who click on the buy button vs the number of people who follow through with a sale. Previous to September, my conversion rate for the people who actually CLICK on the buy button was about 6.5%. In September, that number dropped to 1.16%, the lowest it has EVER been. So what was causing these people to decide to click on the buy button, but not actually buy the product? I would imagine that adding a lower cost alternative to my $497 product wouldn’t affect the conversion rate of my sales. If anything, it should increase the conversions, since it costs less. So the only thing I could think of, was the removal of that scarcity email sequence. It’s shocking to think that removing the scarcity sequence would lead to that kind of a drop in sales, but I’m kind of hoping that it was the smoking gun. Otherwise I’ll need to go back to the drawing board on this mystery. So, for the time being, I’ve re-introduced the scarcity sequence and am crossing my fingers that my sales come back in October. Now let’s get to the good stuff. 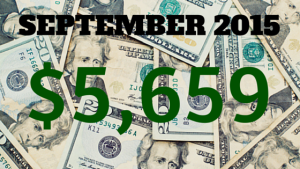 The breakdown of my revenue for the month of September 2015. I find it very useful as an outsider looking into someone else’s business to see where the money comes from, and where the money goes. Sometimes you can identify patterns in other people’s businesses that can transfer over into your own. Whether that be from income, or the way the profits are re-invested. Thankfully since I had such a great month in August 2015 this net loss for the month of September didn’t put my business in the red for the year to date. I’m hoping that my sales will start to climb a bit in October now that I have re-introduced the scarcity email sequence, but since I have such a long lead time before I have a sale, it may not take effect until early November. In any case, I’ll keep you up to date on the goings-on in next month’s income report!